Stop in to our library and see what we have! Advise the librarian of titles you would like the library to have in its collection. 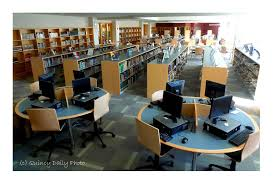 To access the QHS Bradford Library Catalog, under Library Catalogs, choose QHS Bradford Library. In the Library Catalogs menu, you may choose to look at: the QPS Library Catalog, the Thomas Crane Public Library Catalog and Research Databases, and the Old Colony Library Network Catalog. The Library media specialist offers guidance, instruction, and coaching in using information resources critically and effectively. The Bradford library is a popular meeting spot for clubs and study groups. The program helps grow connections between the school, our community and global resources for teaching and learning.